When markets drop, most investors do one of two things: either panic and sell their holdings or hide and hope that their stocks come back someday. But what if you could not only protect your capital in market downturns but also make money? Welcome to short selling or shorting as it is known. This easy to use strategy is widely overlooked by investors and financial advisors who do not know how to use it properly. In my last article, I introduced you to shorting. This week, we will dive deeper into the topic and examine the benefits as well as risks involved. 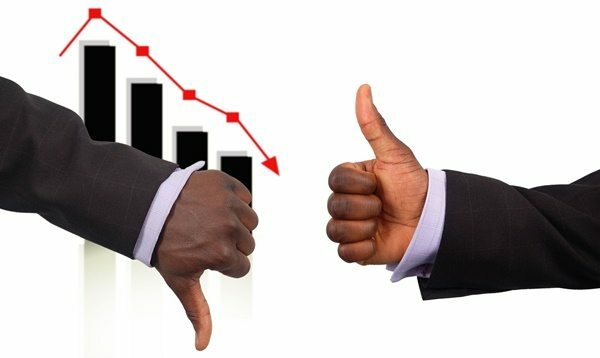 Short selling or “shorting” a stock is a strategy you would employ when you believe that the prices of the stock are too high and you think they are going to drop. We are used to the mantra of “buy low, sell high” as a way to profit in the markets. This is no different except that we will be doing the sale first and buying later. To short sell, you would borrow shares of stock from your broker and sell them. The money you receive for selling the borrowed shares is kept in “escrow” until you close the position. To close the position, you will have to buy the same amount of shares that you borrowed in order to give them back to the broker. The idea behind short selling is to profit from a drop in the price of a stock. For example, you can borrow 100 shares of a stock and sell them at a price of $45 per share. You would collect $4500 but owe the broker 100 shares. If the price drops to $38 per share, you can close the position by buying 100 shares at $38. Since buying the shares only cost $3800, you get to keep the $700 after you return the borrowed shares back to your broker. But what happens if you are wrong and the stock price rises instead? You must still replace the borrowed shares at some point. So, if you sold 100 shares short at $45 like the above example but the price rose to $47, it would now require you to pay $4700 to buy the stock back and close the position. This would result in a $200 loss in your account. The profits in shorting are limited to the price at which you short down to zero as that is as low as prices can go. Theoretically, the potential losses in shorting are unlimited as there is no upward limit for the price of a stock. In reality, though, investors and traders can place stop losses to limit the amount of risk they are willing to take in a short. In contrast to buy and hold or buy and panic sell which both result sustaining financial losses in the market, shorting allows traders and investors to profit from downward movements in the stock market. If you are only buying stocks, you are limiting your profitability to less than 50% of the market movement. Stock prices can move up, down and sideways. When you buy stocks, you make money when prices rise and lose when they drop. The opposite is true for shorting stocks where, instead, you profit from prices dropping and lose when they rise. Anyone who has been active in the stock market can tell you that on average prices drop faster than they rise. This means when you short, you can typically profit faster and lose slower. Any trader or investor with a margin account can enter a short position. Unfortunately, IRAs are cash accounts, not margin, and therefore shorting is not allowed in them. Good news though, there are inverse ETFs and options that are available in cash accounts to make money when prices drop. It is fairly easy for any individual to open a margin account so that they can sell stocks short. Brokers will set aside a certain number of shares from their inventory or from other customer accounts that are available to be borrowed for shorting. There is no time limit for when the shares must be returned. Some traders will go short and close the position in the same day. Investors can short a stock and stay short for weeks or even months. The only difference is that when you borrow the shares overnight, you will have to pay interest on the value of the shares you borrowed. Day traders who replace the shares the same day they borrowed them do not have to pay interest. Shorting is a simple technique that can be used by investors and traders to profit from stock prices dropping. To do it correctly, you must first recognize overpriced stocks that are likely to drop in price. You then need to have the skill to identify the proper entry and exit prices as well as where to place your protective stop loss. The professional trading courses at Online Trading Academy can teach you these things. Be prepared for market crashes and even turndowns. Learn to make money in the stock market regardless of price direction, enroll in a course today!